This grassy bald is definitely a favorite, with true 360-degree views of the Smoky Mountains and an intersection with the Appalachian Trail. For a sunset to remember, get there early and bring a picnic and a blanket—and your camera to capture the colors of the sunset reflected on layers of majestic mountains. Here are directions to Max Patch. America's Favorite Drive—as well as several of the stops along the way—is also a popular choice for some pre-dusk views. Hop on near Asheville and drive south to catch several scenic vistas. 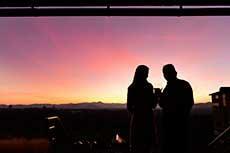 Or choose an overlook to snuggle up next to someone special and watch the stars come out. 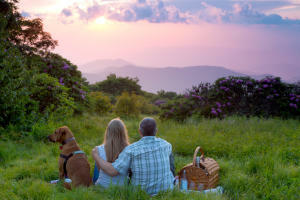 Learn more about the Blue Ridge Parkway. The 8,000 acres of George Vanderbilt's historic estate offer numerous scenic options, from the meadow behind America's Largest Home, to the lagoon with views of the back of the house and a good chance of a deer sighting. Or choose a window-side table at the Dining Room at the Inn on Biltmore Estate and drink in the beauty of the landscape while you sip some estate-grown wine. 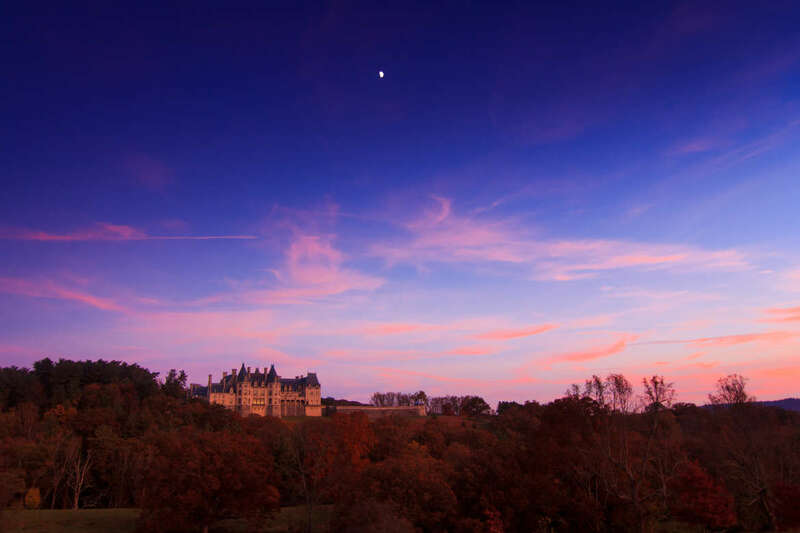 Check out our Biltmore ticket travel packages. 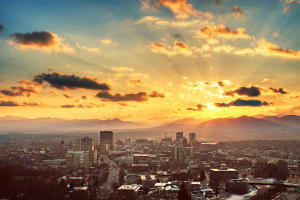 Many readers made a very good point—almost anywhere in the Asheville area is a good place to see the sunset! Because we are surrounded by some of the highest peaks east of the Mississippi River (including the highest), views are bountiful all over town. Whether you're dining in a restaurant, checking in to a B&B, browsing the eclectic shops or even just standing in a parking lot, don't forget to stop and take in the view. Go ahead, start planning your next visit. The most popular spot to watch the sunset, according to the fans, is undoubtedly the Omni Grove Park Inn. The aptly named Sunset Terrace is famous for its dazzling views of downtown and the mountains, as well as for its chop house cuisine. Already have dinner plans? Grab a cocktail and a table in the new seating area just below the main terrace, or order up some duck fat fries and a local craft brew and lounge on a fireside sofa at EDISON restaurant.